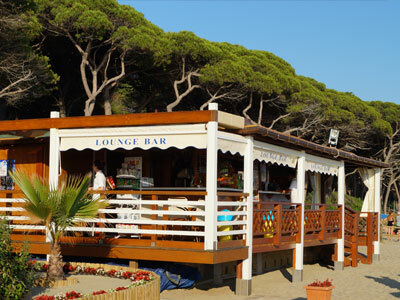 The Bar is located between the pine forest and the beach. From the early hours of the morning, you can sit in our lounge bar and enjoy a relaxing panorama. You will mix the scent of the sea with that of the trees, the chirping of the birds with the sound of the waves of the sea. The natural scenery of this glimpse of the Gulf of Follonica offers a magical atmosphere far from the bustle of the city. From 07:00 to 11:00 am is the time of breakfast, you will be captivated by the scent of coffee and soft music until a certain appetite begins to peep, and here … we are there, ready to meet your needs wishes with hot brioches, pizzas, crushers, … any desire will be satisfied. For those who want to have lunch or want something fleeting to eat, from 12:00 am to 03:00 pm you can sit in our shaded terrace and taste fresh pasta, sandwiches, pizzas, salads. And for those who want it, takeaway service is also available. 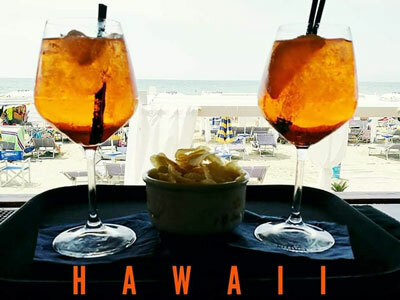 From 05:00 pm to 07.30 pm it’s time for an aperitif, accompanied by Lounge-music, snacks and fruit cocktails, non-alcoholic aperitifs and alcohol will give your palate smiles and lightheartedness while your eyes can admire the most beautiful sunset of Follonica. But it does not end here. During some summer nights Hawaii Beach bar continues until late at night to accompany you during special events and the ever-present “Disco Beach”.